← In a Vase on Monday. Weird Roses. Wordless Wednesday. Anyone for Football? 34 Responses to Wordless Wednesday. Anyone for Football? I love that flower. Mine bloom in the spring. Can you grow it outside? It has to live in the greenhouse here. Yes. I leave it in the ground all winter. We had hard freezes the last 2 years and it came back. It is also reproducing. All the animals know it is poisonous, so it does really well. I remember this; it’s wonderful. Did you grow it from seed? No, I haven’t tried it from seed. It’s a bulb. Gorgeous! I’ve grown Scadoxus puniceus which blooms in the spring but this is even more beautiful. S puniceus is hardy in the ground here (similar climate to yours) but I don’t know about S. multiflorus. It is lovely, isn’t it? It sparkles when the sun shines on it. No, S. multiflorus is not hardy, I grow it in the greenhouse. I haven’t seen S. puniceus, I will look out for it. Matthew is a friend from my gardening club, I think his bulbs are reasonably priced and his list gets longer every year. It’s wonderful. Many bulbs from South Africa grow well here but this is one I’ve seen only in blog posts, generally in the UK and the Pacific Northwest. I’m surprised it’s not available there as it would do well in your garden. I’ve never seen this before. It’s a real talking point I imagine, a show stopper! It is indeed, I bring it into the house when it is in bloom. It is; well worth seeking out. I need one of those! 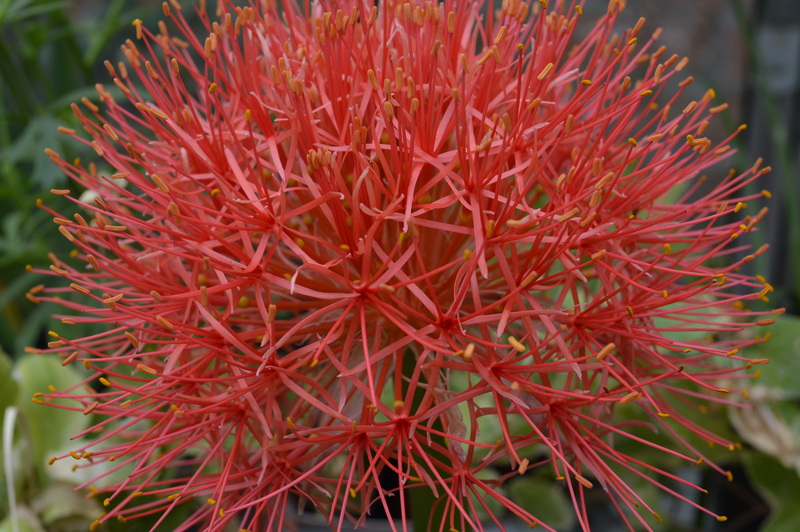 They call them Blood LIly here and they will grow outside in my garden. You certainly need not just one, but several. Good subject for a Wordless Wednesday. The color and form are sure dramatic, aren’t they?! It is dramatic, rather like a firework. Just luscious and new to me – thanks – and for all the comments that drew out answers to my questions! It is readily available in bulb catalogues and well worth looking out for. And I shall do just that! There you are then, a good candidate for your sunroom. It is lovely isn’t it? I do mean soccer, but we call it football. Yes, I don’t know why I only have one, I’d like lots, all dancing and singing together.